Great program, I still use it to do fadeouts on mixes i put together, but it does have one problem: It won't cut mp3s from cuesheets correctly to make them perfectly gapless. 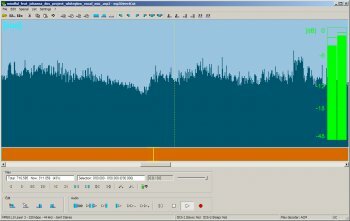 For that the only program that I've found which DOES do it correctly, but which isn't nearly as user friendly, is Pcutmp3: http://wiki.themixingbowl.org/Pcutmp3 . If you know what I'm talking about you're going to have to do some Googling for more info. A most usefully program, small & no ad-ware. Maybe not the most beautiful piece of software out there, but very stable and just a pleasure to use, once you know where all the options are. Thanks! That would be nice to have a similar WAV utility, alas, I have to use full featured applications like Audacity. Inasmuch as the manual was composed several years ago for Version 2.0, there may be some discrepancies with the present version. it is really a good soft ware, like itransferstudio,which can < href="http://www.itransferstudio.com">transfer ipod whenever and whatever. The vbr inaccuracy is fixed! Now cuts based on cue sheets are perfect. Thanks to the author. The only issue that remains regarding to vbr cutting is that MDC doesn't update the lame info in the output files (pcutmp3 can do this). It does precisely what it says it does. It has always worked flawlessly for me. I like to create/edit audio snippets. This program makes this hobby of mine both possible and fun. I found it useful once, and never used since then. Well, it does what it says it does. No more, no less. i've always enjoyed and benefited from this app.. Thanks for keeping it going! Better than other shareware software.